Customized rehab care programs for nursing homes. Therapy Center understands that no two nursing homes are alike, and that each patient population is unique. So, why settle for a cookie cutter therapy program? Therapy Center believes that because your facility has its own systems and protocols, it is vital that your therapy program be adapted and individualized to best meet your needs. We work with you to design a custom rehab care program that increases quality and profitability, while maintaining a focus on education, collaboration, and compliance. Therapy Center uses a close proximity management style. More managers + fewer facilities = increased attention to your business. We strongly believe in dedicating full-time staff to our partner facilities. Employing full-time, salaried therapists allows staff to manage caseloads and cultivates relationships with nursing home staff. We believe in heavily staffing our facilities to allow for extra help when caseloads are high, making sure that supervision standards are always maintained. We believe in becoming an integral part of each facility we service, and feel that it is critical to work with our facilities to develop programs and strategies to effectively maximize efficiencies, maintain achieved RUG levels and ensure that both nursing and therapy documentation are supportive of the level of care being provided. Our record keeping software allows us to document and schedule patients, export electronic bills, and systematically classify patients into appropriate RUG categories for proper reimbursement. In turn, this system provides your administration and our staff with more precise information about each patient, helping better quantify improvements in resident satisfaction, therapy utilization, and profitability. Therapy Center strives to be proactive with regulatory changes by providing each therapist with the education and knowledge necessary to maintain superior quality service. Our Director of Clinical and Regulatory Compliance stays abreast of changes in legislation, constantly providing clinicians with formal training to ensure our documentation and treatment practices are in sync with current regulations. We also provide continuing education and on-site management to facility staff, making sure we are addressing the regulatory requirements that impact patient care and facility reimbursement. Therapy Center believes in keeping nursing home personnel informed. Our Clinical and Regulatory Compliance Department conducts routine in-service training for your facility staff on vital industry changes, such as Medicare & Medicaid (MDS 3.0) and Resource Utilization Groups (RUGs IV). We also provide clinical audits to each of our nursing home clients to ensure that documentation is not only meeting but exceeding quality standards as outlined by the Centers for Medicare and Medicaid Services (CMS). 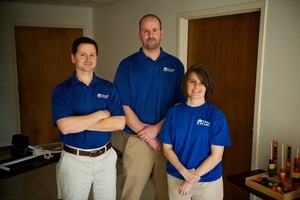 We are part of your interdisciplinary treatment team. We work closely with nursing and Certified Nursing Assistant (CNA) staff to ensure that each patient receives superior quality care, achieves the highest level of functional independence possible, and continues care after discharge. We screen every patient at minimum quarterly, and are available to meet for utilization reviews to provide critical therapy information and discuss patient screens, declines, or functional changes. We are committed to working closely with nurses and CNAs to develop interventions to positively impact these areas of concern. Contact us today at 337-662-5182 for more information on our skilled nursing facility services!